Before I started my year of trying to save money and working towards becoming debt free I ordered a quilt pattern which begged to have some special fabrics chosen for it. 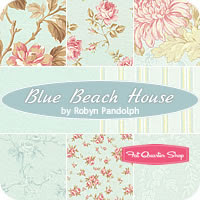 I chose Robyn Pandolph's new range "Beach House". 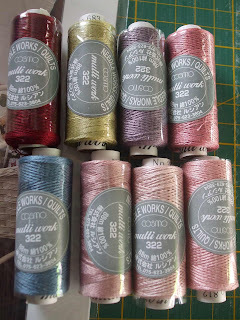 My quilt will pre-dominately be made in the Pinks and Blues from this range. This will be my "year long" project of 2010 and should help me get through the long cold winter nights here in Tassie - Which is my favourite time to hand stitch. This is the project that I have chosen. It is Yoyoville designed by Anne Sutton of Bunny Hill Designs. I just love the little appliqued houses all around the edge and the multitude of yoyo's in the body of the quilt. I figure that if I have a long project to complete it will discourage me from wanting to purchase any more major buys for the year. Let's see if I can stay strong for the entire year. As I was buying the pattern from Bunny Hill I decided to add some 2 strand Cosmo Threads to the order. I hope they are as lovely to stitch with as they look. I of course ordered them in "my colours" of shades of pinks and blues. Now back to frugal living. Do you remember me telling you about Freecycle? The place where things are given away for FREE? On this site you are able to place an advert which goes to all group members in your area to ask for something specific. I decided to try my luck at getting a bread maker. Almost as soon as I posted a request a lovely lady e-mailed me and offered one and even dropped it at my door for me. 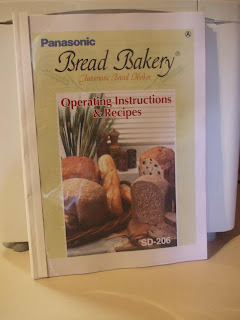 One of my blog visitor's Susan has e-mailed me some fantastic hints, tips and recipes for using with my bread maker to make buns, loaves and pizza bases - I hope to try these out really soon and will share the results and recipes with you then. As part of my idea and tip sharing I wanted to include some from my studio. I recently ran out of template plastic and needed to make a dresden template for a design I was working on. I spied my $25 laminator on the top shelf and decided that would work just fine. 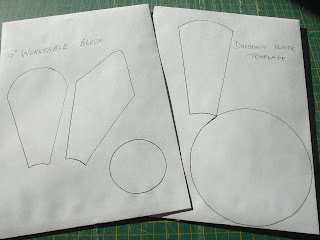 Since then I have made lots and lots of templates to keep using over and over again. It is a fantastic way of saving money and to build a large collection of templates cheaply. You can buy laminating sheets for around $11.50 for 100 sheets at Crazy Sales. 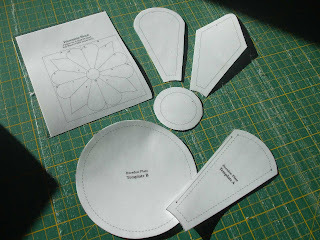 I trace the templates onto the front of an envelope and store them inside. In my quest to try to re-use a lot of our household wastage I found myself left with this big tin. I decided to make a tin to hold all of the money we will be saving each month. 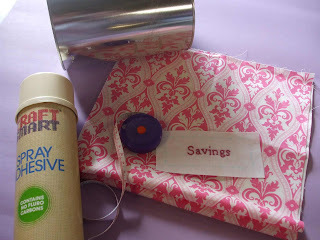 The aim is to take the money from the tin each month and pay it off our household debt. I intend to keep a record of each month's savings. Measure the circumference of the tin and the height. Cut out a piece of cardboard to that size. Cut a piece of fabric 1/2" larger on each side. Spray the card on one side with the glue and smooth the fabric onto it. 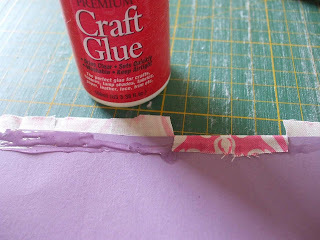 Snip all the way around the fabric and use the craft glue to paste down on all 4 sides. Trace and stitch the word Savings onto the Stitchery Fabric. 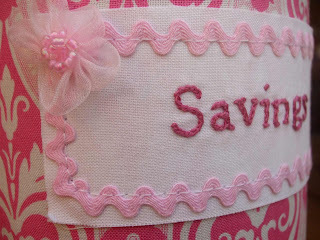 Sew this onto the front of the card and use the trim to cover the stitching line. 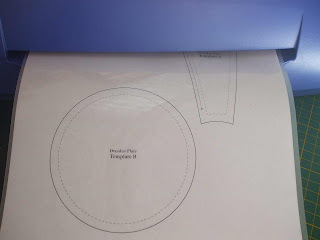 Apply this cover to the tin using the double sided tape - Make sure the join is at the back. 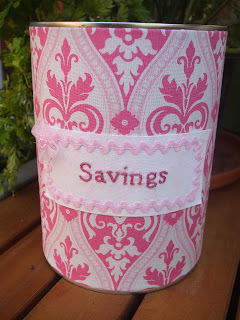 And Hey Presto you have a lovely looking Savings Tin to keep your hard earned $$ in. Next time I will share some recipes I use for Linen Spray, Ironing Spray & Air Freshner and show you how to make the spray bottles look fancy. In anticipation I have given you the layout for theses labels as well as the Savings Label to download FREE the link is HERE. I really hope that you enjoy making it as much as I did. Also next time I have some budget busting cooking recipes including a lovely casserole that is fantastic for the slow cooker. Love Beach house and that pattern... good to have a year long project....Thanks for some more great tips..
Great ideas!! Am loving your new quilt pattern!! Hope to see it's progress during the year!! 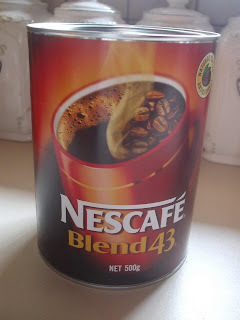 I've just bought one of these cans of coffee will have to give this idea a try ince it's empty. 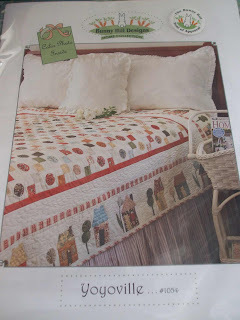 love the quilt pattern and the fabric,very pretty. :) Barb. Oh dear. I'm in love with that quilt pattern. I've been thinking I need to do a scrap quilt to use up my stash, how perfect would this be.....oh dear.....will I be able to resist. I was going to trawl through my mile high pile of mags to find a pattern but I think I'm going to get this one. You are a bad influence. I love your template idea. Very effective. When we were first married, we emptied any coin from pockets and wallets into a tin each week. It wasn't a very big tin, about a quarter of the size of yours, and whenever it was full deposited it into the mortgage account. We figured a smallish tin was good, as it was saving interest in the bank, not the tin. It was a great way to pay off extra without even missing it. 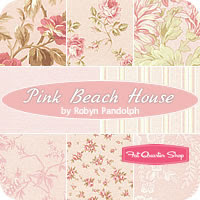 Pink Beach House - oh the lovely images those words conjour up! Especially as I sit here watching the snow piling up. I adore this quilt Fiona, and the fabrics you've chosen. I love your tips too, and especially your tin - so pretty! Thank you for the label! I'm loving your frugal living ideas and tips. You have some great ideas - thanks for sharing them! Love your little Savings tin Fiona. Good luck with the savings. I am trying to be more frugal this year also. 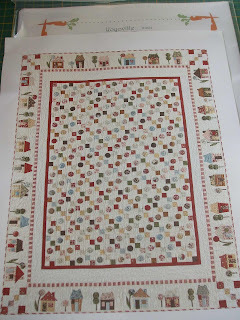 I adore the quilt you have chosen, Bunny Hill Designs has some beautiful patterns... lovely colour threads too! And the 'Savings' tin = gorgeous! Great tip for the laminating... thanks so much for your advice and ideas!!!! I recently stumbled upon your blog and am enjoying it very much. I also amy trying to be more frugal this year. Just started my hand at bread making and moving on from there.Maybe some chickens and gardening this year and much less spending. I am hosting an art giveaway that you might find interesting. Stop by when you have a chance and have a look. Hi Fiona, I have been reading your tips for saving money this year,never too late to start. I had tried croutons last week but thught they did not brown enough .I could not believe it when I read down your tips to find croutons featured, now I know why mine did not brown enough I had not sprayed anything on them. I will have to visit on a regular basis now as all of your tips are relevant and easy to follow. Hi Fiona Love your Hints and Tips so helpful I am off to buy a laminator today thank. I am trying to be more frugal this year also.